After accepting Islam, you might be tempted to immediately start learning about the details of the belief system or the rules governing social interactions etc. But, by far, the most important thing to start learning immediately is how to pray the Salaat, the five-times-a-day ritual worship that is mandatory for all muslims. While there are resources on this website which will, inshaAllah, help you learn the Arabic words that are said in Salaat, you need to start praying immediately. Initially, you can pray along with the audio tracks of the Salaat. You can start doing that by using the instructions below, which will guide you in a stepwise fashion. Go through each tab of the content below sequentially. Much of the material is online but you will have to download some of the handouts. Click the download buttons below to print the Visual Guide to Salaat & Salaat Cheat Sheet. Also see the first 4 min and 30 seconds of the video below to learn how to use these guides. The Visual Guide will inshaAllah help you understand the basic structure of the Salaat and help you figure out the correct time for each Salaat. In addition it will also help you understand how the 2, 3 and 4 Rak.^ah (cycle) Salaats differ from each other. 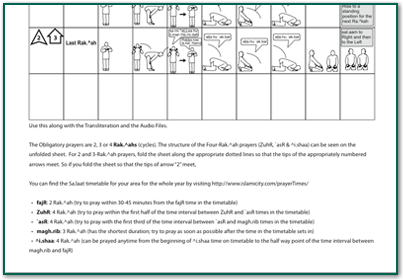 The Salaat Cheat Sheet is to be placed in front of you while praying along with the audio tracks. This Cheat Sheet contains the transliteration of the words of Salaat seperated by postures. While you are learning the words to the Salaat, you can place this cheat sheet in front of yourself and peak at it to refresh your memory and to follow along with the audio. Watch the video below (in two parts) to learn the physical actions and posture changes in the Salaat. Try to copy the postures and movements as accurately as possible. Muslims try to pray in the way that the Prophet Muhammad (PBUH) prayed and this video is based on reliable historical sources of descriptions of the Prophet's prayer. For now, focus only on the actions of the Salaat while watching the video. Each Salaat is 2, 3 or 4 cycles or Rak.^ah. You can find the number of Rak.^ah in each Salaat below along with the specific time intervals for Salaat. These are also listed at the bottom of the Visual Guide to Salaat handout. It is mandatory to be in a state of ritual purity. Most of the time, it would mean doing the Wudoo (ablution) but you may need to do Ghusl (bathing) under certian circumstances. Click on the button on the right to learn how to purify yourself. 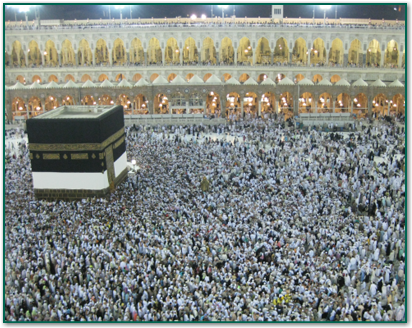 Muslims pray facing in the direction of the Ka^.ba, the holy mosque in Makkah, Saudi Arabia, as a sign of our unity in worshipping Allah. This is also known as the direction of Qibla. You can use the tool below to find the direction of the Qibla in your area. Now that you are in a state of ritual purity and have familiarized yourself with the postures and movements of the Salaat, you are inshaAllah ready to start praying along with the audio tracks of the Salaat. There are four audio tracks on the right. -- The first is the introduction to the audio tracks. Listen to that one first, before you try to pray along with the other audio tracks. -- The subsequent tracks are complete salaat audios for 2, 3 and 4 Rak.^ah prayers. Note that a single beep marks a change in posture and a double beep indicates that you shoult stand back up again to start the next Rak.^ah.